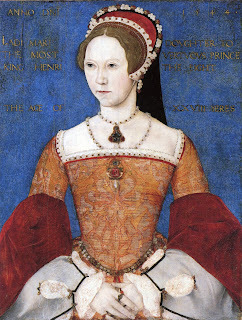 Mary and Elizabeth Tudor are a fascinating pair of sisters. Same father, but rival mothers and seventeen years apart, it is surprising how affectionate the two were throughout most of their lives. One of the main ways that the sisters expressed their affection was through gifts exchanged. We can learn a lot about their situation and relationship from each of these. Mary, as the elder sister, often sent Elizabeth spending money and cloth for making clothes since King Henry often neglected attention to such details. She also gave Elizabeth many pieces of jewelry, some of these pieces can be found in museums today. Her gift giving became so much of a custom, that when the relationship between Mary and Elizabeth turned hostile, Mary’s councilors told her she should send Elizabeth away with a gift so she wouldn’t suspect something amiss. Mary gave her a beautiful sable hood and some pearls before she departed to Hertfordshire. In turn, Elizabeth also sent gifts to her older sister. Small pieces of jewelry, and hosiery were common during her younger years. One of the most notable gifts exchanged between the sisters was during Queen Mary’s reign, after her marriage to Prince Philip II of Spain. Mary believed herself to be pregnant multiple times, and it was during one such assumed pregnancy that Elizabeth made her sister a very special gift, which spoke volumes of her care and loyalty: A set of baby linens meant for the newborn prince. Elizabeth was skilled in needlework, but it still must have taken hours of careful stitching to create such a gift. Of course, the prince was never born, but the sentiment behind the gift remains. When you consider that Elizabeth was the younger sister, who would be eliminated from the succession of heirs with the birth of a prince, and the political tension that surrounded Mary’s false pregnancies, the hand-made baby linens were precious and significant. Unfortunately, photographs of the linens are not available. Like her mother Anne Boleyn before her, Queen Elizabeth I loved gifts all throughout her life. Was it an inherited trait, or did it begin with the gifts her sister gave her during her youth? Either way, giving gifts to Elizabeth became an important part of foreign and domestic affairs during her era. Many ambassadors attempted to win her favor by presenting lavish gifts. 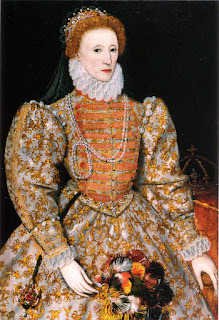 Elizabeth also bestowed gifts upon those she favored, and such exchanges became a key part of the Elizabethan court. Isn’t it amazing how a simple exchange between sisters could influence the culture of a realm? Two-time winner of the Christian Indie Award for historical fiction, Amber Schamel writes riveting stories that bring HIStory to life. She just released her first non-fiction work, Twelve Sisters Who Changed History. Visit her online at www.AmberSchamel.com/ and download a FREE story by subscribing to her Newsletter! Informative and interesting post about Mary and Elizabeth Tudor with their gift giving. Giving gifts to siblings is still carried on today as a result. Thank you for sharing, Amber. I'm looking to reading 12 Sisters Who Changed History soon. Thanks for stopping by, Marilyn! I hope you enjoy the book. Who doesn't love getting gifts? Thanks for the post!